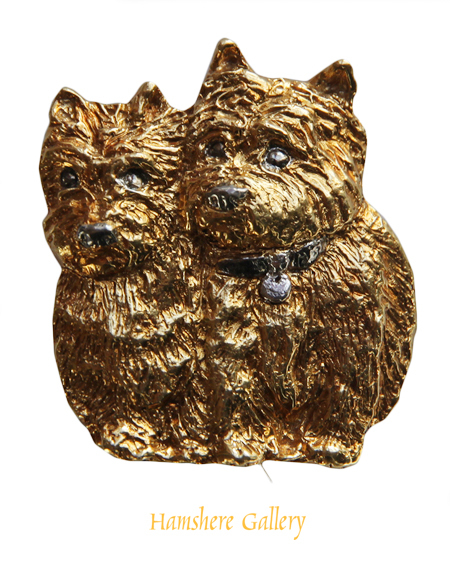 1 ) A 1960's 18 carat gold Cairn Terrier brooch retailed by "Garrard The Crown Jewellers"
3 ) Miniature on ivory of "The Kings Dog" by Agnes Hordern ARMS. 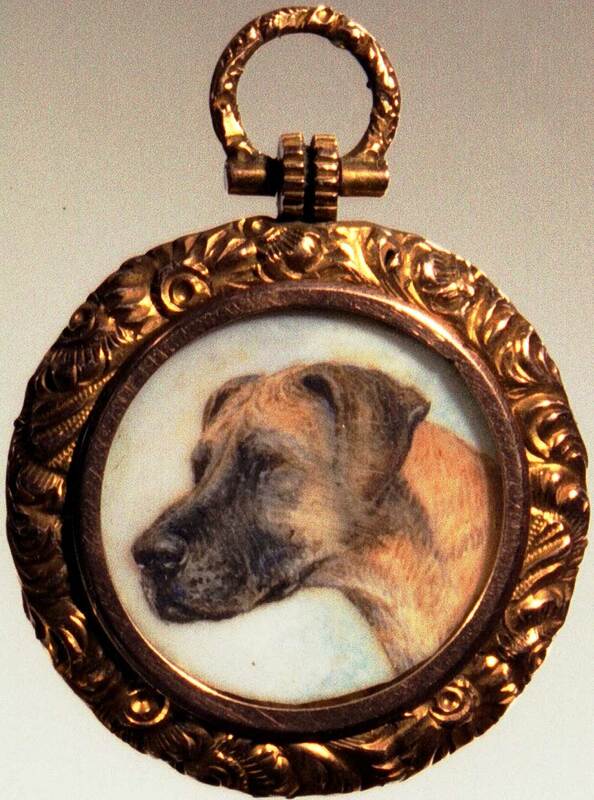 Gold set pendant of the Pug, "Jack of Hearts" by Reuben Ward Binks. To the reverse titled and signed "Jack of Hearts R Ward Binks". Breeder and owner Mrs. D. Varian, "Jack of Hearts" born 14th October 1919 by Tzar of Moorfield- Shadunah. 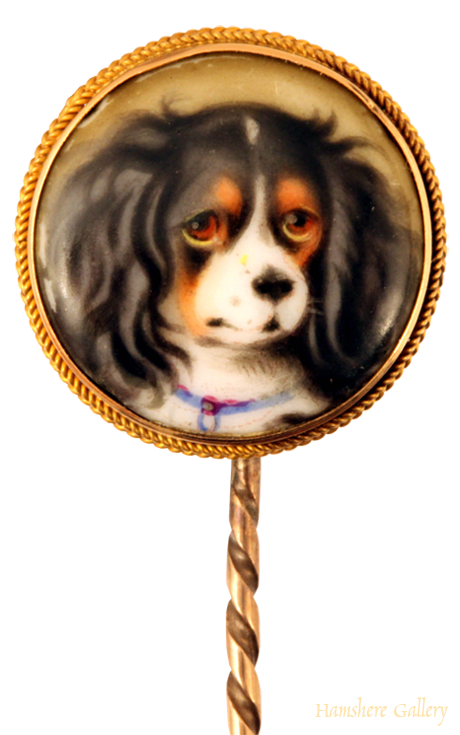 8 ) Enamel on porcelain of Princess Victoria's favourite spaniel, "Dash" a King Charles Cavalier Spaniel after a painting by Sir Edwin Landseer RA (1802-1873) given to the Princess on her birthday 24th May 1836. 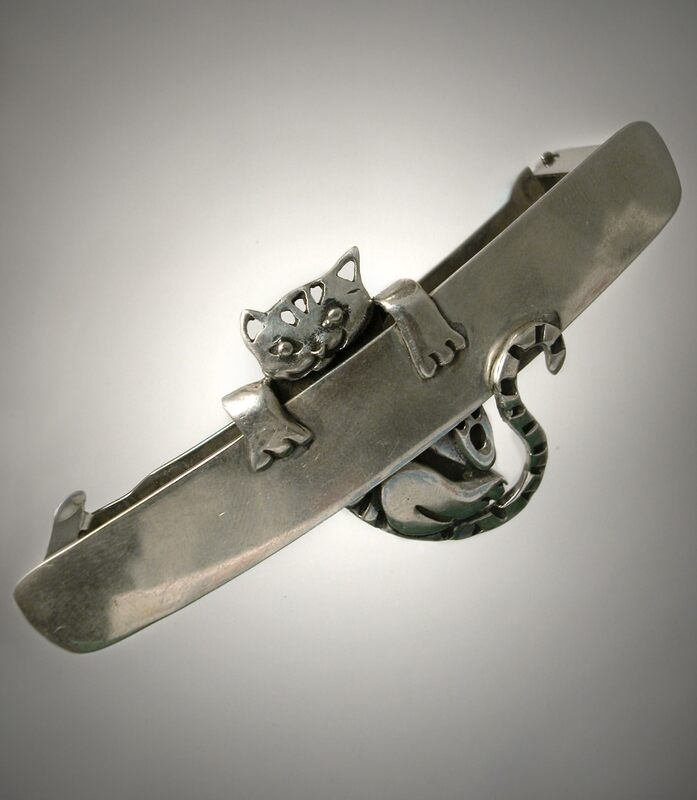 A Sterling �950�silver cat clip by Emilia Castillo. The reverse marked �Emilia Castillo 950 Mexico MR� �T0-85, and �MADE IN FRANCE�. French, circa 1990�s. A superb 18 carat gold and gem brooch of three kittens framed in a garland of Baroque leaves peering upon an absconding mouse, sculptured by Edmond-Henri Becker (French 1871-1971). The cats eyes inlaid with Demantoid Garnets. The reverse equally carved and incised in great detail. 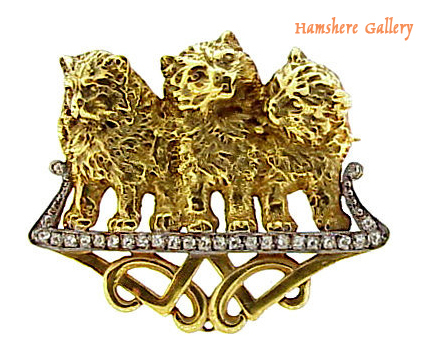 The pin bears two assay marks one being the lion of Louis Aucoc (1850-1932). 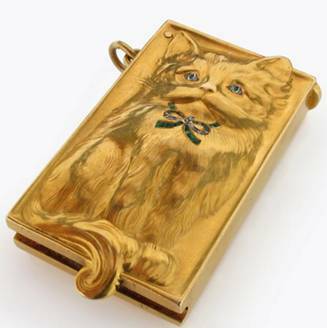 In 1908 he exhibited another gold sculptured brooch of three kittens at the prestigious 'Paris Salon'. Edmond-Henri Becker was commissioned by such famous firms as Louis Aucoc fils (1850-1932) and the prestigious house of Frederic Boucheron. See 'La Bijouterie Francaise au XIXe Siecle' by Henri Vever, page 904, for an item of jewellery by Louis Aucoc sculptured by Becker 1899. 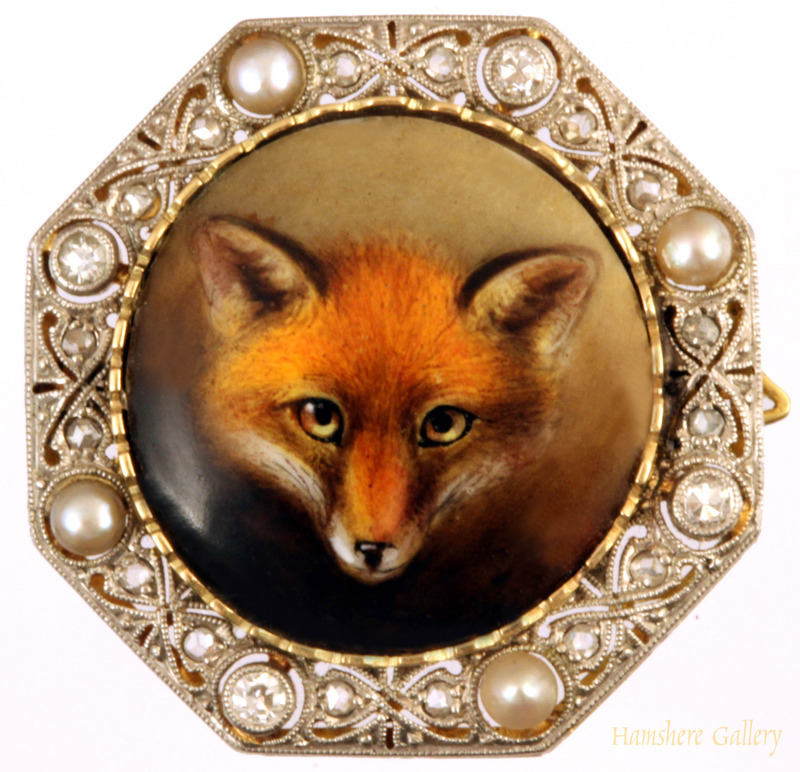 Enamel platinum, diamond and pearl set brooch of a fox mask by William Essex. The enamel mounted in beaded and rope designed mount. Most likely the enamel the work of William Essex. The platinum, diamond and pearl setting American, circa 1905. Typically portray by Essex from the painting of the fox mask by Abraham Cooper. "The Royal Collection" today holds a substantial number of enamels by William Essex. 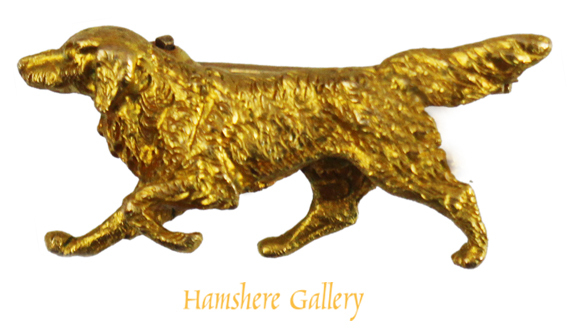 13 ) Enamel gold set brooch of a fox mask by William Essex (English,1784-1869). 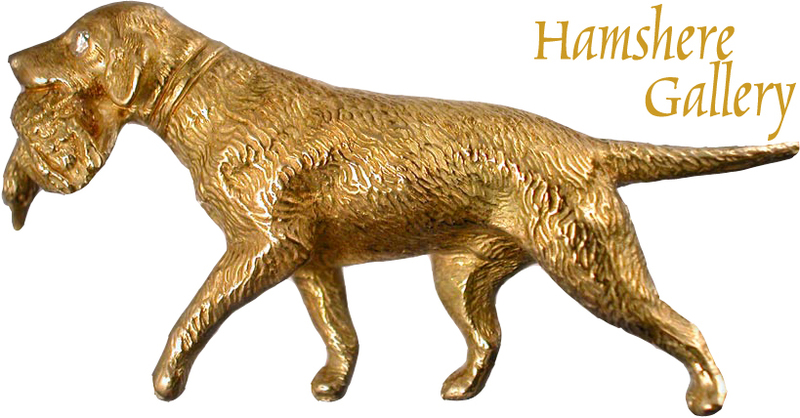 Enamel gold set brooch of a fox mask by William Essex. The enamel mounted in beaded and rope designed mount. Signed and dated to the reverse "W Essex 1863". 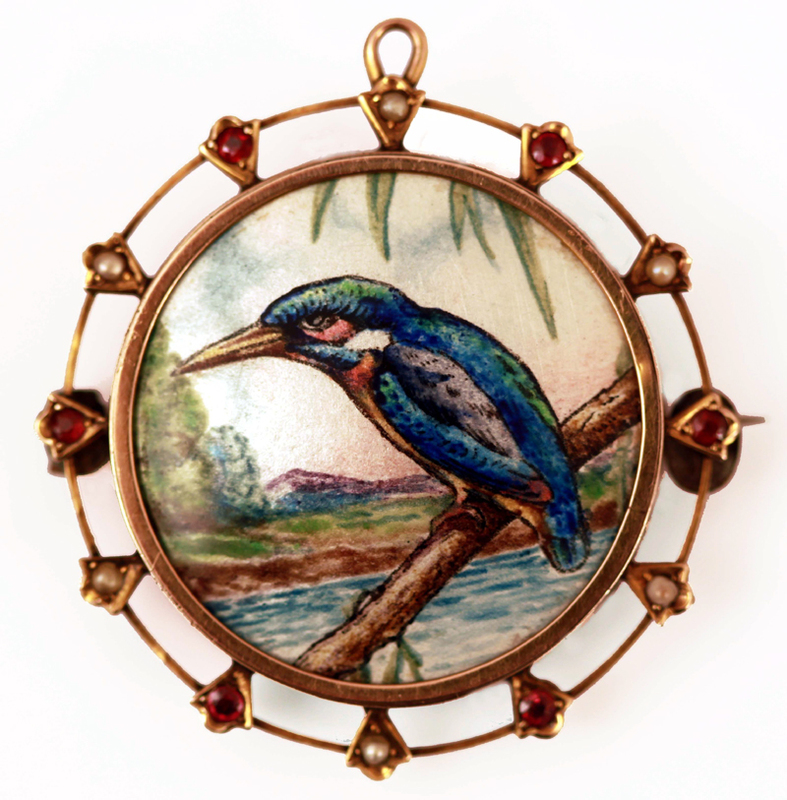 "The Royal Collection" today holds a substantial number of enamels by William Essex. Typically portray by Essex from the painting of the fox mask by Abraham Cooper. 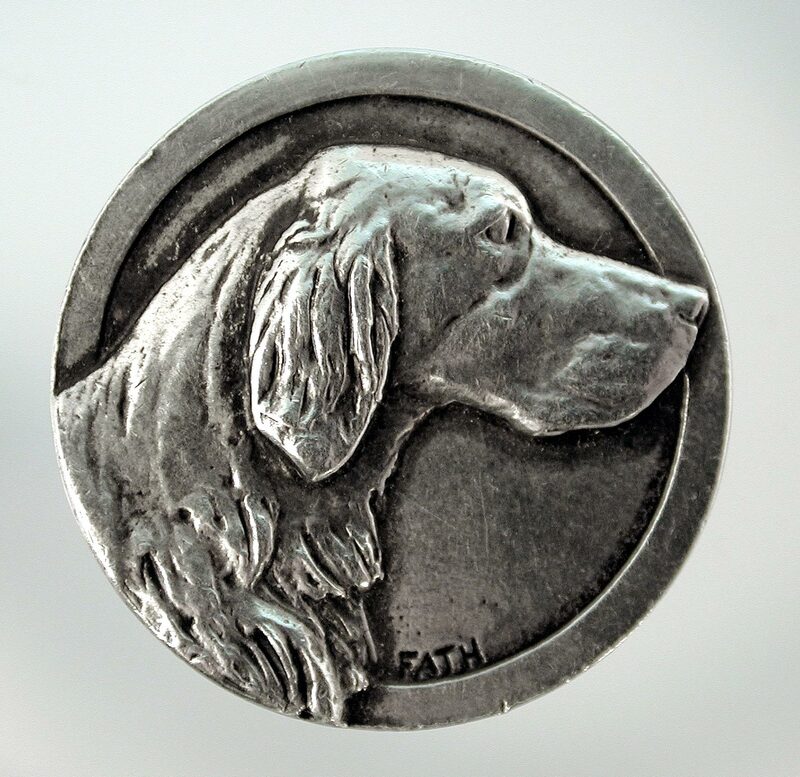 Richard Fath (1900 - 1952), silvered button medallion pin, of a Cocker Spaniel, signed 'Fath'. French, circa 1930. A mid 20th century silvered pendant, of a Pointer / Braque by Richard Fath (French, 1900-1952), signed �FATH�. French, after 1930. 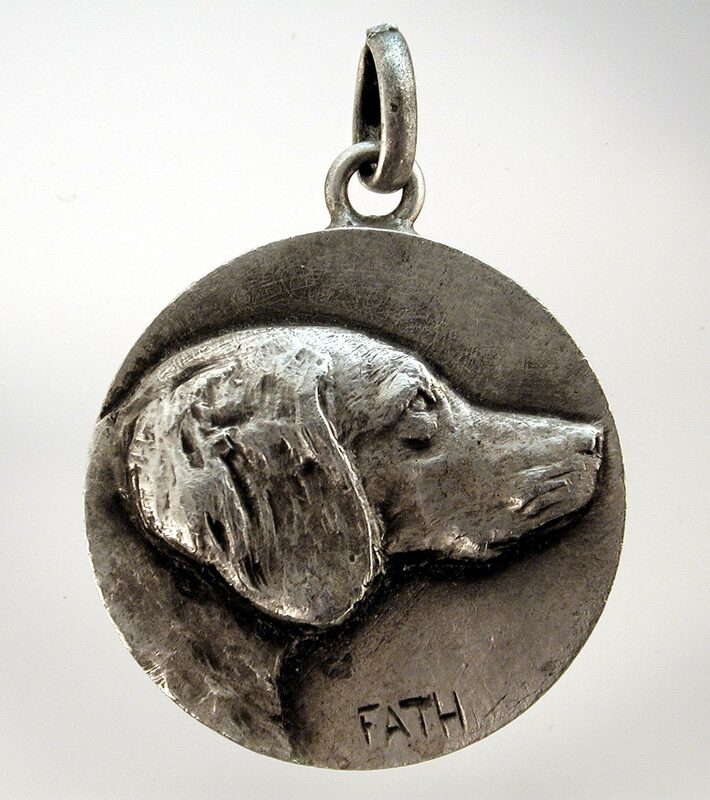 A mid 20th century silvered pendant of a Retriever by Richard Fath (French, 1900-1952) , signed "FATH". French, after 1930. 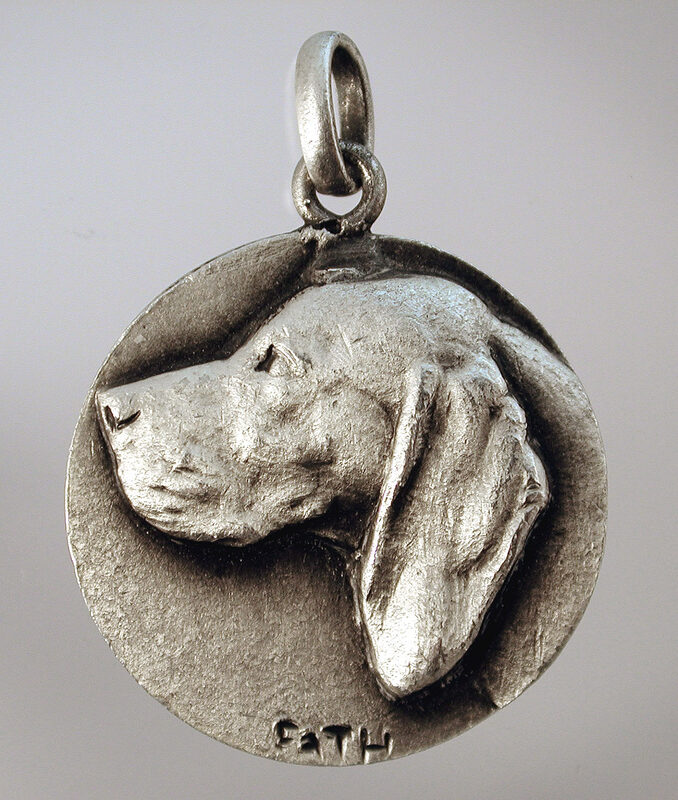 A mid 20th century silvered pin, of a Setter by Richard Fath (French, 1900-1952). Signed "FATH". French after 1930. 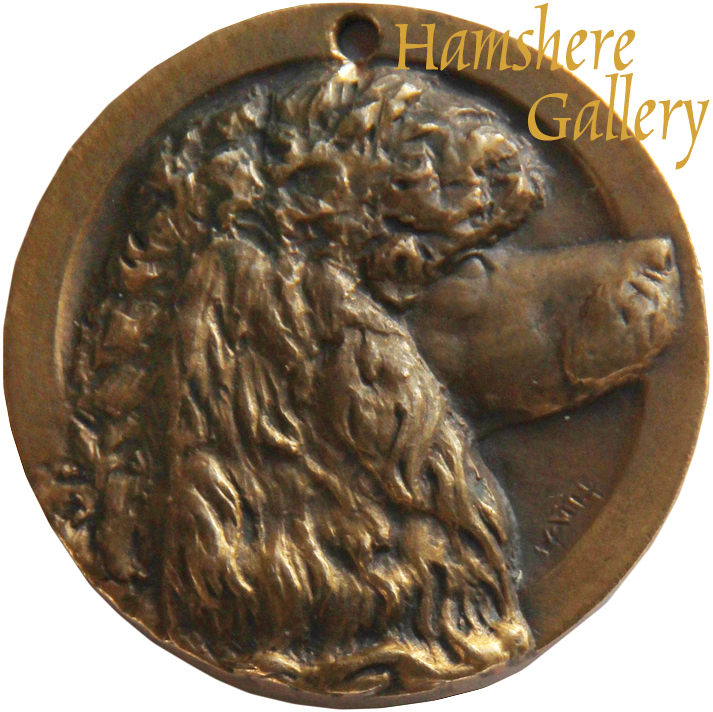 Small circular bronze medallion of a Poodle's head by Richard Fath (French, 1900 - 1952).Signed "FATH". French, circa 1930. 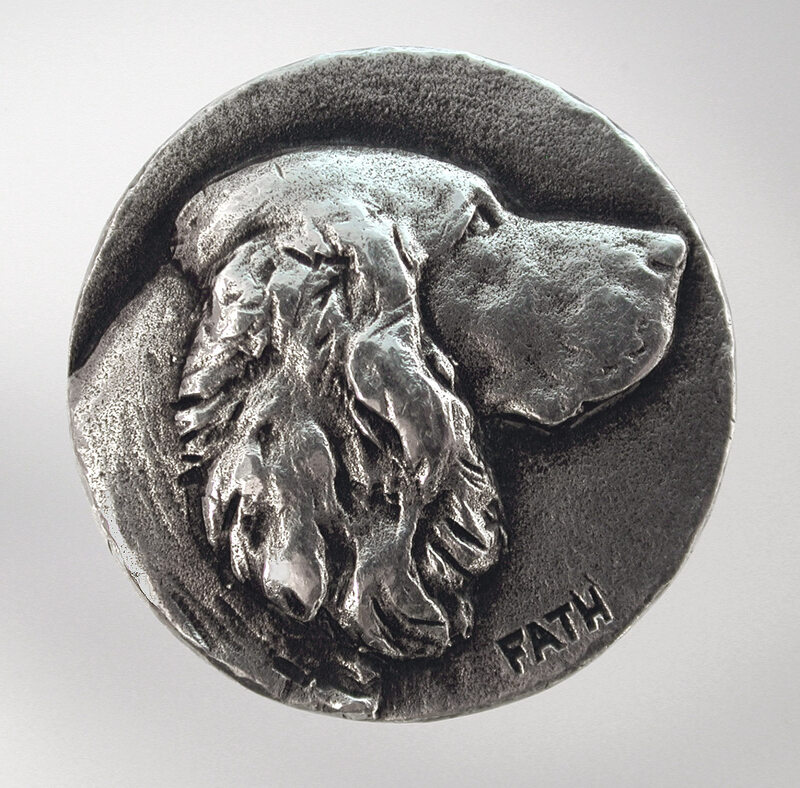 Small circular bronze medallion of a Setter�s head by Richard Fath (French, 1900 - 1952).Signed "FATH". French, circa 1930. 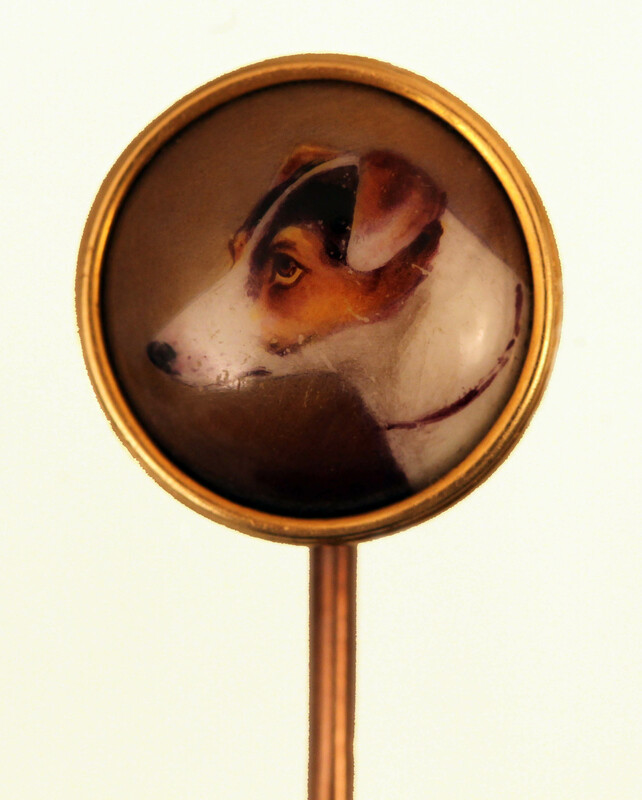 21 ) SOLD Enamel stick pin of a Fox Terrier by William Bishop Ford. 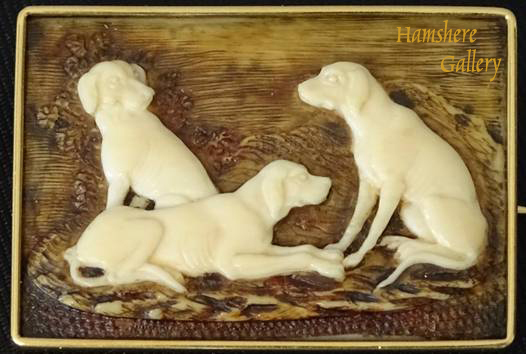 Miniature on ivory of the Great Dane "Lass of Walmesley" a prize winning dog owned by Mr & Mrs Ernest E Fox. Ernest Fox was a founding member of the Great Dane Club. 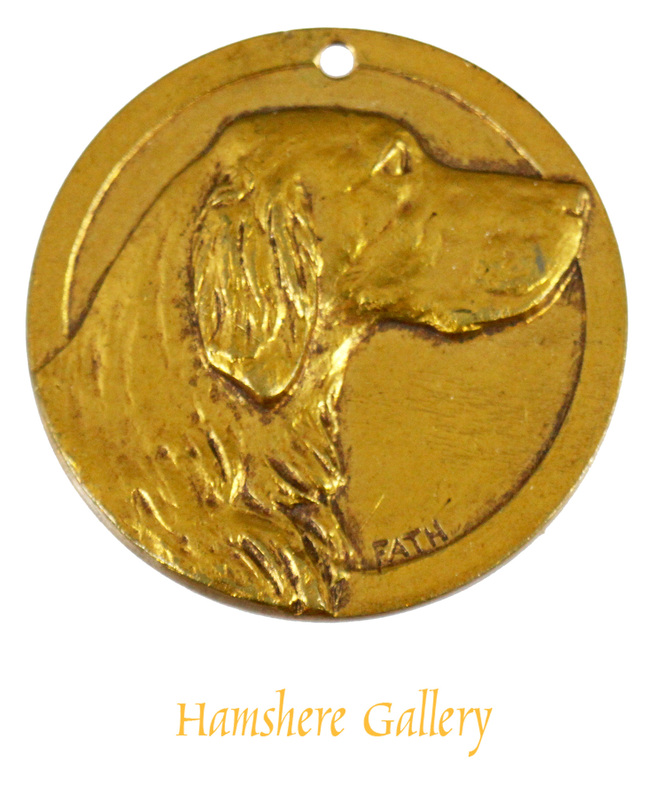 Mounted in gold as a pendant. English, circa 1915. Provenance through descent of the Fox family. 24 ) Silver Kenart Brooch of a standing Wire-haired Fox Terrier. 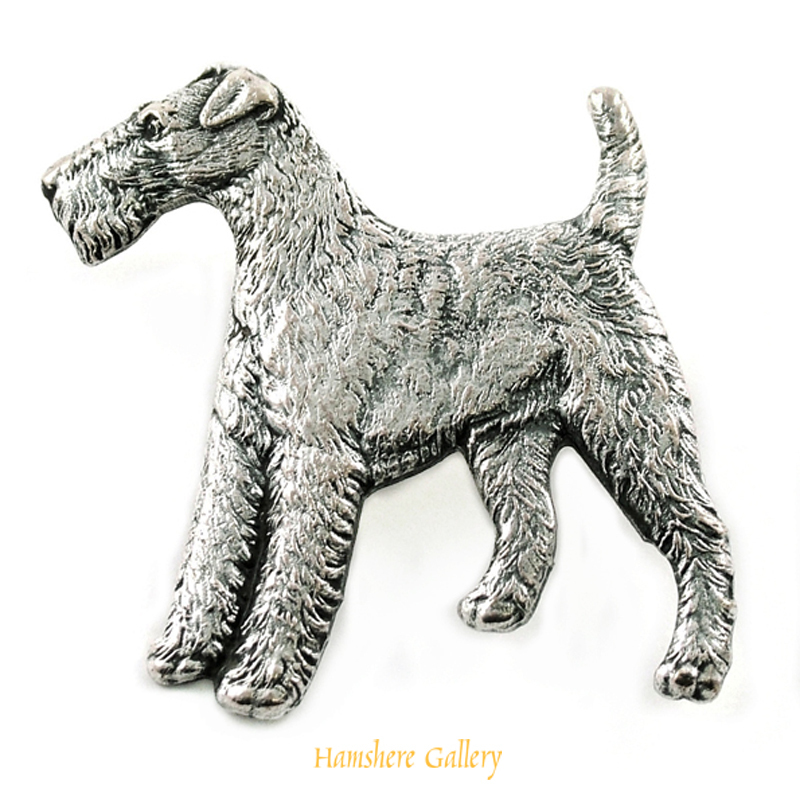 Silver Kenart Brooch of a standing Wire-haired Fox Terrier. Made by the Manchester firm, they were introduced at Crufts circa 1923 and the company stopped making them in the 1970s. English, circa 1930. West Highland Terrier stick pin. 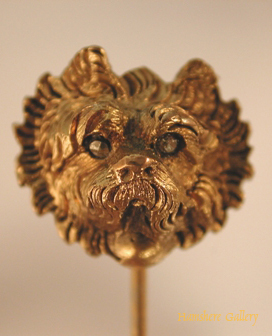 Gilt metal stick pin of the West Highland Terrier "Scratch" made famous by Sir Edwin Landseers' (1802-1873) famous oil painting titled "Dignity and Impudence". English, circa 1880.